The question I am asked most often is "How do you have time for all this?" Generally, the asker means my social media use. I think of my social media use as professional learning time. Learning is important to me and we always make time for what's important to us. But, I do have a very specific workflow to my social learning. I created this infographic with Canva (be nice, it's my first attempt at an infographic) to outline my process on a typical day. Not everyday but most days. Everything in the Sources and Share section happens on my phone and usually before I'm out of bed. Later is done on the computer. As soon as my alarm goes off, I check my Feedly. Feedly allows you to add blogs or websites and then pulls the latest posts. 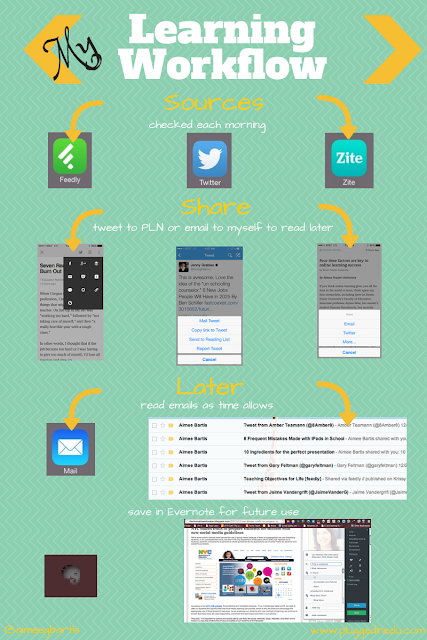 My Feedly is so powerful because my Personal Learning Network (PLN) is full of awesome writers. After Feedly, I move to Twitter. Again, Twitter is powerful because of my PLN. I try to follow a diverse group of educators to push my thinking. If I have time I check in with Zite. Zite is personalized based on my interests. I do not wake up early enough to read all the great information in my sources. I read all my Feedly posts. If they speak to me, I share them via Twitter to my PLN. I skim Twitter. If someone has posted something that sounds interesting, I will email it to myself to read later. Throughout the day when I have 5 or 10 minutes, I read the articles I've emailed to myself. If I want to share it to my PLN, I leave it in my email for later (I don't usually tweet at work). If I want to save the article for later, I clip it into my Evernote account. I do most of my curating in Evernote. I have notebooks for all my current projects as well as some general topics. That's my workflow. How do you handle your professional learning through social media? I use Feedly as well, but Monday is my day to browse through the previous week from Feedly. Twitter is my other major go-to daily. I utilize the "favs" part of Feedly to save posts I feel I may use later. Evernote serves as my other "warehouse" to store information I would like to access later. Thanks Paul! I haven't used the favs section of Feedly. I'll have to check that out.